If your balcony/courtyard isn’t inviting, you’re unlikely to take full advantage of it. But just one move can completely transform it from a boring slab of concrete into an inviting outdoor room (especially when preparing to sell your home). 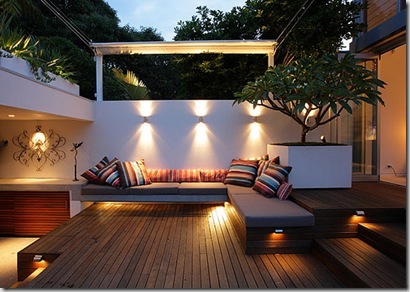 Assess how much time, money and help you have, and figure out what’s annoying you out about your outdoor area. Perhaps there’s too much sun, there’s not enough light at night, it’s too chilly most of the year, your table top gives people splinters or there are so few plants nearby that you don’t even feel like you are outdoors. Check out these 4 balcony enhancement strategies and decide which one can make yours a place where you’ll enjoy spending more of your time. 1. Add candlelight: Oversize hurricanes glow with warm light, instantly adding a romantic ambience. 2. Add textiles: Throw pillows and outdoor rugs now come in fabrics that stand up to weather, so you can use print, colour and pattern with these items as you would indoors. 3. Bring in the shade: A larger umbrella transforms this space, providing a temporary ceiling that encloses and defines the space. 4. Add fire: Whether it’s a permanent installation or one of the many portable versions available on the market, a fire pit lets you enjoy your terrace/courtyard later into the night (and keep you warm! ).